*Won a physical ARC in a Goodreads giveaway. My review remains honest and without bias. I really liked Ashley's debut and was looking forward to reading more by the author. So imagine my excitement when I won a copy of her latest in a Goodreads giveaway that I'd randomly entered thinking I'd never win. 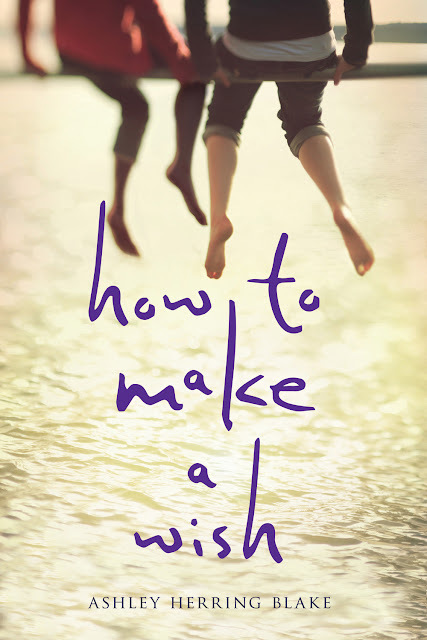 Welp, I'm thankful to have gotten the pleasure to read How to Make a Wish because I liked it as much as her previous. This was certainly an interesting story. There were various things taking place and it wasn't only about Grace's roller-coaster life with her mother. I liked how she was also developing as an individual and learning to understand herself more. But let's start off with the situation with her mother. If that's even what you call her. The stuff she puts Grace through was just horrible. It's truly sad that she'd lost her husband when Grace was very young, and it's tough for many people to seek help and learn healthier ways to cope. But lord, this woman pissed me off so much. This "mother" constantly put her daughter in dangerous and uncomfortable situations where their roles were ridiculously reversed. Grace, a teenager, had to become an adult fast in order to look after her mother. It was so painful and frustrating to read the scenes where I wished this woman would get her crap together and think about her daughter more. What also frustrated me was the fact that Grace would make excuses and would even try to defend her mother whenever the best friend and his mom spoke up about it. I get that it's actually something many of us would do, no matter the hell they were putting us through, but I wish she would have come to the realization sooner that the only way her mother would get help was if Grace took herself out of the mess and gave her the ultimatum that she couldn't be in her life if she was going to continue living like that. That one drama aside, it was nice seeing how Grace was able to connect with someone. Even though Eva was dealing with her own problems. I liked that the two girls bonded and Grace could unravel more in regards to her emotions and aspirations. The issue with her mother threatened every relationship Grace had, including her friendships, but thankfully she addressed it all by the end. To conclude, I'm very satisfied with Ashley's second novel and so happy to have discovered her. How to Make a Wish has lucid writing with emotional moments and topics some may relate to. I look forward to wherever this talented storyteller takes us next. Ashley Herring Blake used to write songs and now she writes books, including Suffer Love. She reads them a lot too and has been known to stare wistfully at her bookshelves. She lives in Nashville, TN with her husband and two sons. I have never heard of this author before. Its good when you take up a book hoping for great things and you got what you hope for. Great review. Ooh I hope you'll give her a shot because her two books so far are pretty good. I was afraid of that at first, but it actually made me want to keep reading so I could find out how it'll end. Yeah, she was a piece of work! Wow, this sounds really intriguing. Haven't heard of the author before but I think I'm checking out this book. Great review! Sounds like this was a bit of a hard read, but it was good that Grace was able to find someone to give her strength. Love the review!